The Washington Nationals squeaked by the Atlanta Braves in a 2-1 victory on Monday night as right-handed starter Doug Fister tallied his thirteenth win of the season. Fister threw 104 pitches and 74 strikes in seven innings pitched and gave up two hits and three walks while striking out three batters faced. 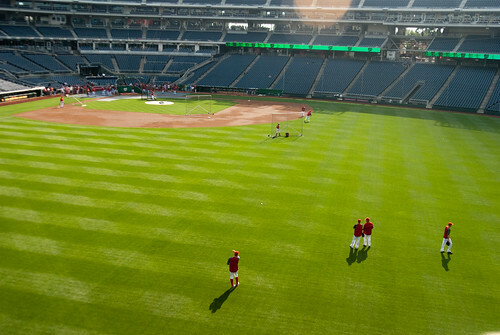 Sunday afternoon’s game got off to a rocky start when the Washington Nationals committed two defensive errors in the top of the first inning against the Phillies but Washington went on to beat Philadelphia 3-2. Left-handed starter Gio Gonzalez went six innings while giving up two runs (one earned) on five hits and striking out three batters on 105 pitches (67 strikes). The Phillies did score a run in the top of the first as a result of both outfielder Denard Span and third baseman Anthony Rendon committing a pair of consecutive throwing errors on a Grady Sizemore single hit to center field but Gonzalez bounced back and settled in allowing his pitches to work for him rather than against him after that; Phillies 1, Nats 0. Four walk-offs in five days, a nine-game winning streak, and first place in the National League East – that’s where the Washington Nationals currently stand after their 3-2 victory over the Arizona Diamondbacks on Wednesday night. 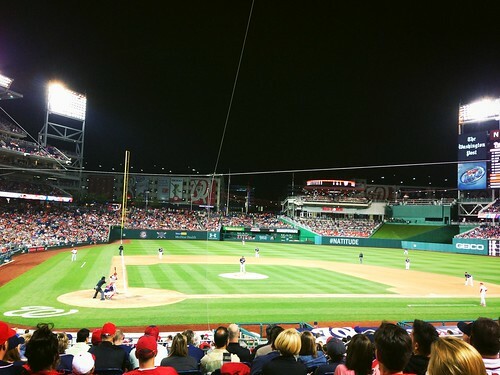 After a strong seven-inning shutout appearance from right-handed pitcher Tanner Roark for Washington, reliever Tyler Clippard blew the save, but the Nats came back in the form of an Anthony Rendon pinch-hit RBI-single in the bottom of the ninth with one out and two on base to win it. The Washington Nationals showed the New York Mets what dominant pitching and a productive offense is capable of on Wednesday night when right-handed starting pitcher Doug Fister led the Nats to a 7-1 win over New York. Fister’s delayed start on the season may have slowed him up slightly in the beginning but he’s now 11-3 in 2014 with signs of slowing down. 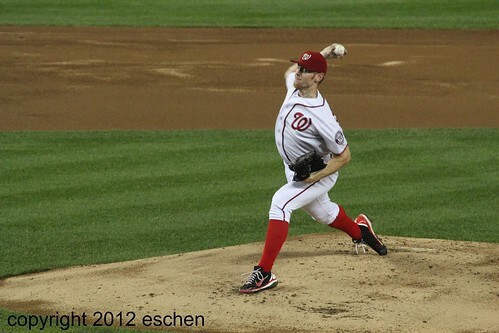 Fister gave up six hits and struck out seven batters over seven and one-third innings pitched. He threw 101 pitches (69 strikes) and gave up one unearned run in the eighth inning after cruising through the rest of the game. Fister was so efficient on the mound that the game itself only lasted two hours and thirty one minutes. And these days, a sub-three hour game is rare, so that was a gem in and of itself as well. It was a hot and humid one in D.C. on Wednesday night but the Washington Nationals braved the swamp-like elements to complete a three game sweep of the Colorado Rockies with a 4-3 victory. Starting pitcher, right-hander Doug Fister had just one blemish on an otherwise efficient outing which came in the form of a three-run homerun in the second inning for the Rockies. A game that was well-within the Washington Nationals’ grasp got away from them on Monday night during an eighth inning implosion from right-handed reliever Tyler Clippard allowing the Los Angeles Angels to win 4-2 in D.C. The Washington Nationals secured a much needed 3-1 victory over the St. Louis Cardinals Friday night thanks to a strong pitching performance from left-handed starting pitcher Gio Gonzalez and a few timely hits. The night’s victory helped snap the 8-0 losing skid between Washington and St. Louis, which dates back to 2012. Gonzalez threw 101 pitches and 65 strikes against St. Louis over seven innings. The Cardinals managed four hits, one run, and a walk against the lefty but Gonzalez fought back with seven strike outs on the night. That strong outing was exactly what the Nats needed in order to fend off a hot-hitting and defensively sound Cardinals squad. The Washington Nationals’ struggles against top-tier teams in 2014 continued on Thursday night with a 0-8 loss at home against the St. Louis Cardinals. 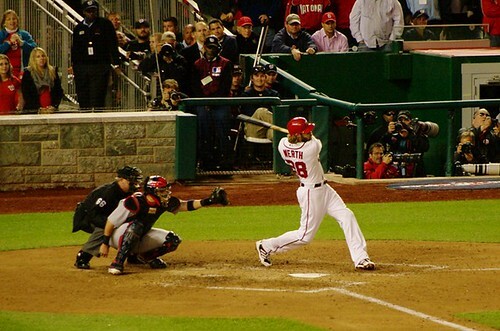 Right-handed pitcher Adam Wainwright held the Nats to just two hits in the complete game shutout at Nationals Park. Washington’s right-handed starter Taylor Jordan had a shaky first inning which did not increase the Nats’ odds of finally beating a team they’ve dropped seven consecutive games to (eight counting last night). Jordan lasted five and a third innings and gave up seven hits and seven runs (five earned), walked two, struck out four, and hit a batter on 96 pitches (61 strikes). The Washington Nationals found themselves on the winning side of 5-0 game against the Miami Marlins Tuesday night thanks to a solid outing from left-handed starting pitcher Gio Gonzalez and impressive offensive efforts from first baseman Adam LaRoche and third baseman Anthony Rendon. Gonzalez threw 101 pitches, 61 strikes, over six innings and gave up three hits while walking two batters and striking out five to secure his second win of the season. 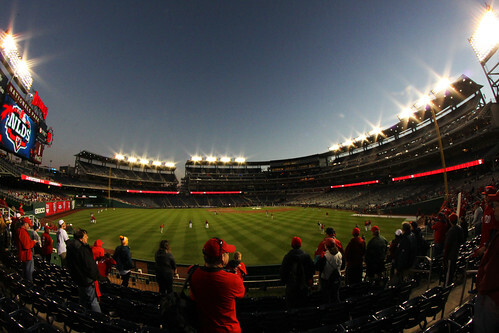 Washington scored early, taking a one-run lead in the first inning when LaRoche drove outfielder Jayson Werth home with two-out. Manager Matt Williams’ line-up failed to score again until the sixth inning, but that’s when things got interesting. Starting pitcher right-hander Dan Haren had an incredibly rough night on Saturday when the Washington Nationals lost to the New York Mets 11-3. Haren lasted 2 and 2/3 innings and threw 57 pitches (41 strikes). The Mets managed nine hits and seven runs off Haren and struck out three times. Baseball’s season may be starting to wrap up with just a few weeks left to play but, despite their place in the standings, the Washington Nationals managed a three-game sweep of the Miami Marlins after securing a 9-0 victory on Wednesday night. Left-handed starting pitcher Gio Gonzalez got off to a rocky start for the first two innings, which is reminiscent of his performances earlier on with the team, before settling in come the third. Gonzalez threw seven innings and gave up three hits while walking three and striking out eight on 108 pitches (74 strikes). 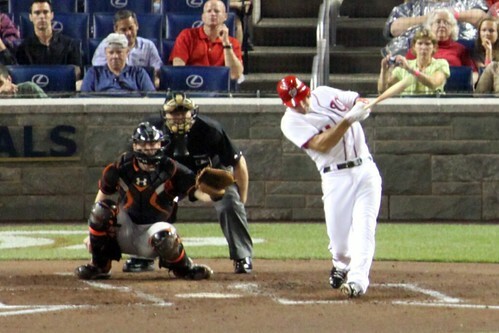 Tuesday night’s game at Nationals Park was far from being a marquee match-up. The fifth place Miami Marlins came to town to face the second place Nats and played in front of the smallest crowd of 2013 since April 10. 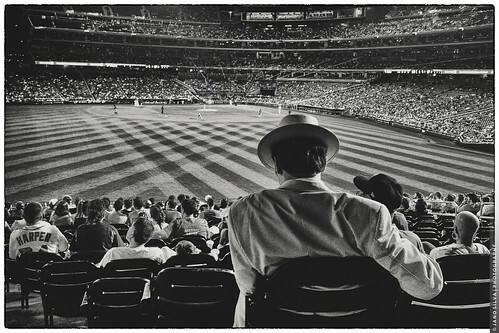 24,616 in paid attendance occupied the ballpark while the Nats secured a 2-1 victory over the Marlins, nudging themselves back over .500 by a game. Right-handed starter Ross Ohlendorf pitched five innings plus one batter, struck out three, intentionally walked one, and gave up three hits and a run (on a homerun) on 78 pitches (50 strikes). The Nationals managed to prevent a shut-out game versus the Pittsburgh Pirates on Wednesday night but wasted a quality start by right-handed pitcher Stephen Strasburg falling 4-2 in game three of a four game series. In the team’s season-high sixth consecutive loss, the Nats starter threw eight innings and gave up two hits and one run – a homerun to Pirates third baseman Pedro Alvarez in the second inning – while striking out a season-high twelve batters on 118 pitches and 80 strikes.